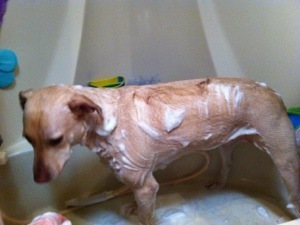 Gave our dog, Sugar, a much needed bath this morning. She was a little on the smelly side :/ She did very well, I think she rather enjoyed it actually. I like to use dawn dish soap and Dr Bronners lavender soap on her. The Dawn is gentle on her skin and kills the fleas, the Dr Bronners makes her smell very nice. I noticed to that her skin eczema has almost completely cleared up since we switched to an all natural dog food with Salmon. This entry was posted in Blog and tagged Daily Life, Sugar. Bookmark the permalink. ← A busy February 1st!